of iron, steel, die-cast Aluminium, resistant to corrosion and with cooling fins. 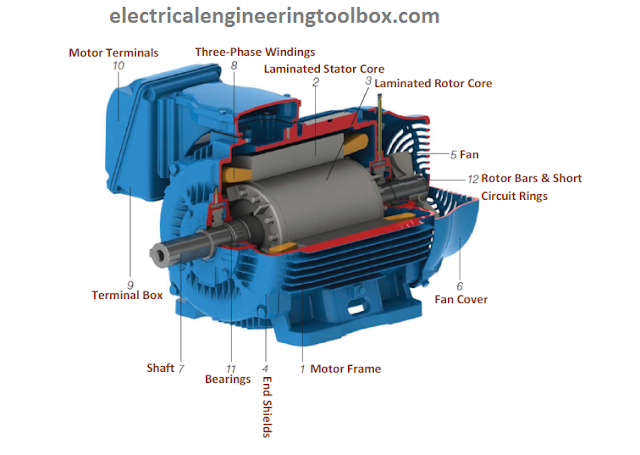 The rotor of a three-phase squirrel cage Induction motor consists of a set of non-insulated bars that are interconnected by short-circuit rings. What characterizes an induction motor is the fact that only the stator is connected to the power supply. The rotor is not power supplied externally and the currents that flow through it are induced electromagnetically by the stator from which comes the induction motor name. 7 – Shaft. It transmits the mechanical output developed by the motor. 9 – Terminal Box. This houses the electrical terminals of the motor. 11 – Bearings. These support the rotation of the rotor.